Russia is witnessing a growth in the popularity of running. According to people involved in the sport, it is the social networks and contemporary digital technologies that have made running so attractive. 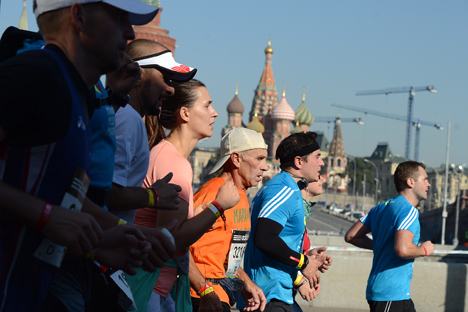 On September 21 the 2nd Moscow International Marathon took place in the Russian capital. The winner, who had completed the classic distance of 42 kilometers and 195 meters (26 miles and 385 yards), was Kibet Barngetuny from Kenya. The prize was almost 1.7 million rubles ($44,300) and more than 9,000 people participated in the event. In comparison, only 5,000 people participated in the 2013 marathon. Yet the growing size of the event is an indication of the resurgence of interest in running – in Russia’s larger cities at least. Moscow's first marathon in 1981 gathered just 200 athletes, yet with every year the number of participants grew. After Mikhail Gorbachev came to power, the new political thinking of the age made the country more open to novelties also in sport, and running became quite fashionable. More than 9,000 people took part in the Moscow Marathon. 4,257 of them completed the full; distance of 42 km 105 m (26 miles and 385 yards), and 5,300 people were able to run more than 10 km (6.2 miles). In 2013, out of the 5,000 participants, 2,366 made it to the end; 2,412 ran more than 10 km. During perestroika the Moscow marathons took place under the banner of Russian-American friendship: Foreign athletes became permanent participants in Moscow’s celebration of a healthy way of life. The height of the mass marathon was 1990, when the event consisted of 18,500 runners, 11,000 of whom ran the full distance. The following year the Moscow marathon was to double the number of participants, but the collapse of the USSR and the subsequent economic crisis hindered the evolution of the mass sport. Running became interesting only for a limited number of people, and until recently, running traditions seemed to have completely disappeared. Mass running events in Moscow started taking place again only a few years ago. "I began organizing marathons three years ago after being inspired by the ones in Berlin and Paris," says Dmitry Tarasov, organizer of the Moscow International Marathon. Tarasov originally teamed up with sporting brand Nike to set up a running club called Run Moscow. He attracted interest in his project by traveling to various universities and giving talks. The success of the club eventually led him to organize a full-fledged marathon. “After the first race the number of participants in running clubs drastically multiplied and Moscow's interest in running grew substantially,” says Tarasov. “The new generation of runners grew up on well-organized events and we want to give these people a marathon in Moscow that would meet their high requirements." The organizers' efforts were not in vain. Lately, running in Moscow has become very popular, especially among the young. Specialists say that digital technology has played an important role in the promotion of running. Besides the Moscow Marathon, Russia also organizes two large running events: the White Nights International Marathon in St. Petersburg, which takes place in June, and the Siberian International Marathon in Omsk (in Western Siberia, 1,700 miles from Moscow). The Siberian Marathon also took place on September 21. "Running is not only fashionable now, it is interesting," says Vladislav Melkov, trainer at the Loverunning school. The individual is not aiming only to finish their run. They follow their run with the aid of a program that measures their pulse, their calories consumed, and that draws the route. After the run the data is integrated with an electronic training dairy or a social network, where their friends and co-runners can see the running report, write enthusiastic commentaries that pep them up and stimulate them to their next run." People of a mature age also take up running. "I started running thanks to a personal example," says Eduard Bezuglov, who has participated in many races in the World Marathon Majors, including the 2014 Boston Marathon and the 2014 Moscow Marathon. At the time Bezuglov weighed 18 stone and his sole exercise was a game of football once a week. “I didn't even imagine back then that I would be running. But it was a great occasion to use the sneakers,” he says. After success in a 3-kilometer race at his fitness club he began registering in large marathons: New York, Berlin, Riga, Amsterdam. “I was hooked and now I can't imagine my life without running." The Moscow Marathon is still only a local event: 80 percent of the participants are Moscow residents and there are only a few foreign runners. About 400 Americans and 100 French took part in this year's marathon. The organizers, however, intend to fix this situation. "In a few years we will focus on attracting more foreigners," says Dmitry Tarasov. "We are in contact with the heads of running clubs from all over the world and many of them want to come with their teams.